Your Next Stamp Challenge #26~ Make Your Own Flower! Hello! 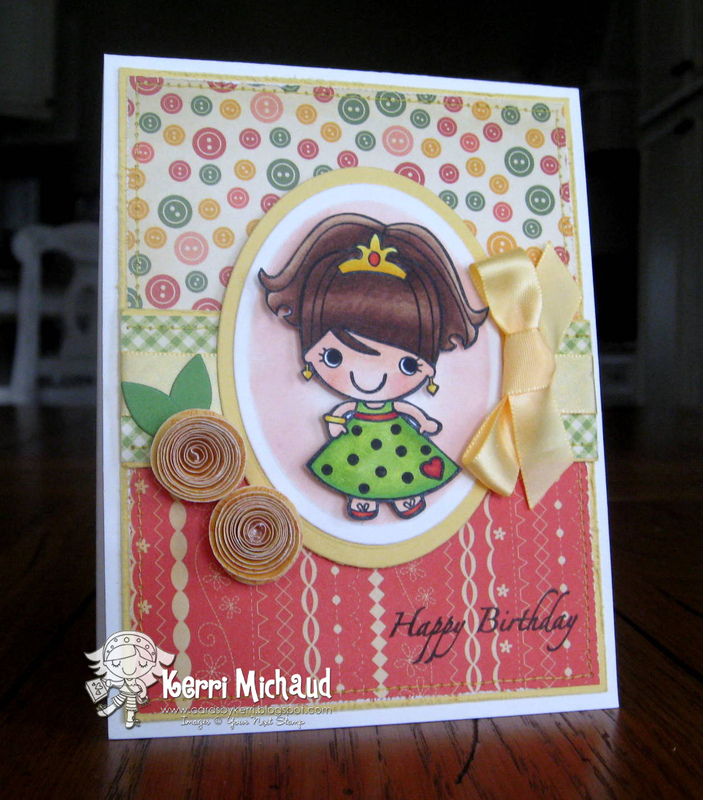 It's time for another Your Next Stamp Challenge, and this time Wendy has challenged us to create our own flowers:) I decided to pull out my brand new Rolled Flower Die-namics die and I used this cutie pie image~Party Fhiona. Love her! The dp is Cosmo Cricket Material Girl, and the sentiment comes from the YNS set Elegant Greetings. 1. Winner – one lucky winner, chosen by random.org, will win $10 in YNS Stamp Bucks (to spend on YNS stamps) and the Winner Blinkie to proudly display on their blog! 2. Top Pick – one lucky entry, chosen by Wendy, will win $5 in YNS Stamp Bucks (to spend on YNS stamps) and the Top Pick Blinkie to proudly display on their blog! [You must use a YNS stamp on your creation to be eligible to win the Top Pick prize]. Love the party girl...and your perfect-as-usual coloring job. Those flowers you made are adorable...nice and tight....really really cute. Oh girl!! This is gorgeous!! I so love your coloring of the image and those flowers...wow!! I want that die!! Awww she is soo adorable! Love your coloring and design, beautiful flowers! SOOOOOO Beautiful Kerri!!!!! I LOVE LOVE the flowers you created and your behind the image is AWESOME!! WOW girl your coloring is FABULOUS! Adorable!! I love the cute image, and the colors you used!! So sweet! She is so cute! Love the rolled flowers! Stunning! Love your flowers and layout and coloring! Ok I just love it all!!! Super cute! Love your coloring, those fab papers and the great rolled flowers! This card is so cute! I love the rolled flowers so much! A wonderful card Kerri, so cute! This is so sweet Kerri. Love it. Too cute Kerri! I've been looking for that rolled flower die but cant find it anywhere. If you know where I can find it please shoot me an email. Love those rolled flowers!! Love your card design and your coloring!! Darling! Love the rolled flowers and your layout!